Yay, I'm so glad you picked it up and enjoyed it Kelly! It's such a heart warming and overwhelmingly warm book filled with hope. Thank you for linking me! I loved it. Immensely. Thank you so much for the recommendation, I knew I would have loved it too but had no idea how much it would effect me. Books like this are important because it educates young people to the plight of immigrants fleeing war and poverty. I have an office mate who is literally one of the "boat people" from Vietnam. Her story leaves me in awe no matter how sad and, more often, disturbing it was. It really is Joy, even probably more so for Australians as we're incredibly multicultural and apart from Indigenous Australians, have all migrated from another country. It was emotional and utterly captivating. Wonderful review :-) This book sounds absolutely beautiful :-). We need more books like this and to get them read! I'm always quick to pipe up with "Hey my grandmother was a Boat Person A**hole" whenever I hear people bashing migrants (I blame the government and modern media for the hatred). Essentially for those of us who aren't Indigenous, we're all migrants. My mum migrated to Australia in the fifties as well and although it's not the same as seeking refuge, her family came to Australia by boat for a better life and opportunities for their children as well. It's a phenomenal read Sarah, I loved it! I can't wait to see what you think of it and I couldn't agree more. Young adult is as complex as teens themselves are and I think a lot of the criticism stems from adult authors who are probably upset that even adults chose to spend their money on young adult novels. I wish they would stop policing what others read. Could you imagine having to leave your home to seek refuge in a country that probably doesn't want you? I can. When I was (much) younger, we lived in a country that got itself a "military crisis" (not quite a coup). Our backup plan, if we couldn't leave by plane, was passage on an Australian bound cargo ship. We had emergency bags packed and ready. Of course, Australia wouldn't turn us away (since we're Aussies), but it was a pretty terrifying prospect for me as a child, and that feeling of not knowing if we'd get out, and being scared we wouldn't, was one I've never forgotten. It's confronting at times, but it's ultimately a story of hope and a bid for freedom. I was so incredibly moved by the narrative and couldn't agree more. It's so important that our rich history of migration is being told to new generations, so they can understand how important it is for those seeking asylum and needing security in such a turbulent world. My goodness, I NEED this book, Kelly! I too was interested when I read Jeann's review and added it to my wishlist- but wow, another glowing review from you, and I absolutely MUST get my hands on this. I love an inspiring book, and this sounds so, so well done! Fabulous review! I honestly have no words to describe how touched I was by Freedom Swimmer Shannon, especially seeing it's based on the authors father and his own bid for freedom. It really does make you appreciate what we tend to take for granted. It'll appeal to the wider audience too as the characters converse in modern day English. Such a wonderfully poignant read. oh that is such a good topic to touch on. I have heard a lot about freedom swimmers, but to write about it is such a challenge! makes me appreciate not being born there. My grandparents are Chinese, and they moved to Malaysia I think before Chairman Mao came to power. It sounds like such a devastating period in history and one that would have ultimately effected every family who lived through the regime. Being based on a true story makes Freedom Swimmer such an incredibly important read. I would love to see what you think of it Ailyn. It's such a wonderful read Resh and beautifully written. I was drawn in by the beautiful cover but it also sounds like a powerful story. It's incredible Karen, such an important read. Loved it immensely. This sounds like a touching read. A book which really highlights the harsh past of communist China and also the struggles which so many went through to escape and survive when it really looked like there was no hope. It sounds like a powerful book and one I want to be able to read. Fantastic review. Thanks Becky and it truly was. 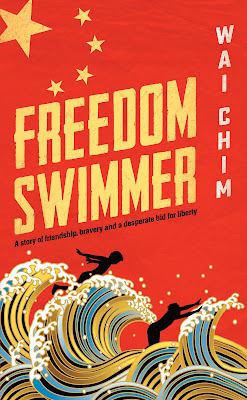 After finishing, I was Googling all about China's freedom Swimmers and reading others stories. So moving and powerful. Thanks Verushka, I was trying to do the book justice but it was just too magnificent for words. She completely convinced me and I'm so glad she did. It was one of my favourite reads of twenty sixteen. It's incredible and can't wait to see what you think of it. Ooh, that's perfect Garaldine! Can't wait to read your review! Thanks Marianne and long time no see. How have you been sweetheart? This is an amazing read, so incredibly poignant and a book that stays with you long after the final page.